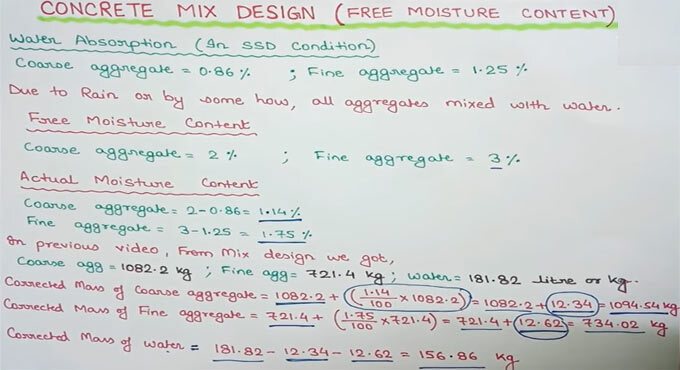 This construction video tutorial sheds light on moisture content condition in concrete mix design by adhering to IS 10262 standard code. Oven-dry (OD): All the moistures are separated from the aggregate by heating in an oven at 105 C to constant weight (heating is normally done all through the night). All pores are empty. Air-dry (AD): All the moistures are separated from surface, but inner pores are partly full. Saturated-surface-dry (SSD): All pores are filled with water, but there should not be any film of water on the surface. Wet: All pores are entirely filled with water containing a film on the surface. It demonstrates the "equilibrium moisture" state of the aggregate in concrete; i.e. the aggregate will neither soak up water nor leave water to the paste. The moisture content of aggregates in the field is much closer to the SSD state as compared to the OD state. The bulk specific gravity (BSG) of aggregates can be obtained more precisely by the displacement method in the SSD condition. The moisture content can be worked out directly from measurements of (BSG) with the displacement method. In SSD condition, water absorption rate is lower and hence percentage of coarse aggregate = 0.86% and percentage of fine aggregate = 1.25%. Because of rain and other factors, the water is included in aggregates and it is known as free moisture content. Under this state, the percentage of course aggregate is increased to 2% and the percentage of fine aggregate is increased to 3%. To get more detail, go through the following video tutorial presented by the renowned civil engineer, Mukesh Shah.